What is the Meaning of “Ferrari”? The iconic brand known as Ferrari originated in 1939 by Enzo Ferrari and its rich history includes a logo that first appeared on a 17th-century regiment’s uniform and later on a World War I fighter plane. What may surprise you is that the name itself is quite common in Italy, though in modern times its imbued with the legacy of the world’s preeminent supercar maker. What Does “Ferrari” Mean in English? Ferrari is one of the most common surnames in Italy, and derives from the name Ferraro, which means “blacksmith.” Ferrari also shares the same root as the Latin ferrum, which means “Iron.” Given the prevalence of the name in Italy, it could be considered equivalent to “Smith” in the United States — though there are obviously no Smith supercars! Ferrari’s Formula 1 racing team is called Scuderia Ferrari, with Scuderia translating from Italian as “stable.” There’s an obvious connection between this and the carmaker’s iconic Prancing Horse logo. What Does the Ferrari Logo Mean? One of the most famous logos in the world, Ferrari’s distinctive Prancing Horse can trace its origins back to 1692, when the Royal Piedmont Regiment was founded by the Duke of Savoy, Vittorio Amadeo II. Over time, the regiment adopted a stallion as its insignia to go with fire-red lapels and cuffs on their uniforms. Much later, during World War I, Francesco Baracca called back to the regiment with a stallion painted on the fuselage of his biplane. In the 1923 Circuito automobilistico del Savio (Savio Racing Car Circuit) in Ravenna, Enrico and Paolina Baracca entrusted the now-iconic symbol to the winner of the race: none other than Enzo Ferrari himself! Today the stallion lives on with every Ferrari vehicle, running rampant in front of an iconic canary yellow background. While the name itself may have common origins, Ferrari has grown into a modern legend, with vehicles that are the envy of auto enthusiasts the world over. 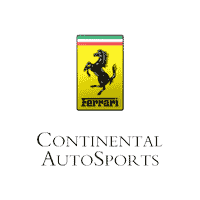 If you’ve like to inquire about buying a Ferrari near Chicago, contact Continental Ferrari. We can also serve drivers throughout the country, so don’t hesitate to reach out even if you live in St. Louis or Indianapolis. Celebration of the best LOVEMARK!